Flame cord - extremely survival cord, could be used as fire tinder in any emergency situation. 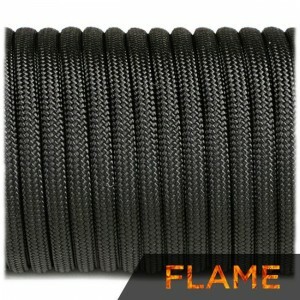 Flame Cord starts easily, burns very hot, and lasts for a long period of time. And, of course - waterproof, UV, mildew and rot resistant. When you need the fire tinder remove the inner strands, light just like any fire tinder and build your fire. After the inner jute strand is used, the outer shell can be reused like before, for lanyards, key chains, zipper pulls, or emergency lashing. Up to 180-200 kg load on break.